The Central Intelligence Agency — the CIA — is known as one of the world's most secretive and effective government agencies. The agency's motto is, "Ye shall know the truth and the truth shall set you free." Created in 1947 during the Truman administration, the CIA collects and evaluates intelligence relating to national security. Responding to changing global realities, the agency now addresses such high priority issues as counterterrorism, counterintelligence, international organized crime, narcotics trafficking, and arms control. CIA operatives have located a number of dangerous al-Qaida operatives in the Middle East and eliminated them with strikes from Predator drone aircraft. 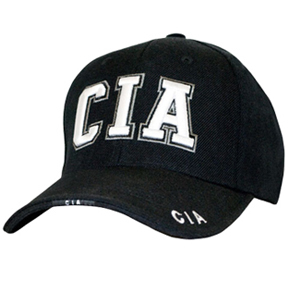 This adjustable CIA Cap can be worn everywhere to show your dedicated and patriotic support of the agency that keeps this nation safe from terror. Wear the cap and send a message to your friends and neighbors that you believe the U.S. — with the considerable help of the CIA — should remain firm in its battle against terrorism.